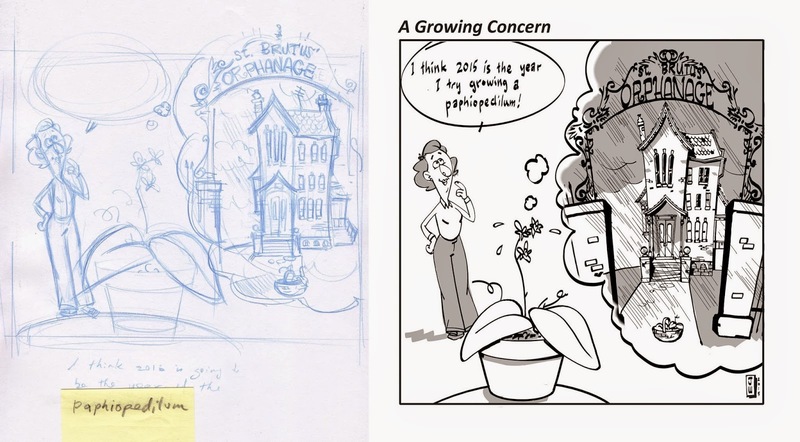 As you can see by comparing the rough on the left and the final inked version on the right, I had a pretty good idea of what I wanted with this one. What did I say about winging it?! How 2014! By the way, Happy New Year!!! I like how the orphanage building itself turned out. I was going for a Mr. Magoo, UPA style. Looking at the metal sign over the gates, I see I should have added more designy stuff around the word "Orphanage". I wanted to make the plant in the basket between the gates clearly visible and planned on doing that with cast shadows but that didn't coincide with the rainy overcast day I had in mind. The rain helps sell the idea of how miserable a place it is and fortunately, it also helped to highlight the basket. The woman also turned out well. I tried to indicate smiley eyes by pushing her cheeks under the eyeballs, but perhaps it isn't quite in style. Maybe I should have shown lower eyelids instead and done them like clam shells. Something I'm not terribly happy with is that the whole thing doesn't read quite as well as I'd hoped. I think it would have read better if the whole thing were rectangular with the long edge on the top and bottom and put more space between the three elements - the woman and her word bubble, the plant in the foreground and the thought bubble containing the orphanage. As it is, I think it's too crowded, and the sweat and thought bubbles coming off the plant aren't visible enough, but what do you think? And yes, for those tricky spellings, best write them out beforehand! I like everything about this one. Everything is well drawn and -- the building is fantastic! Nice and elongated and wonky and... perfect. Hey, did you draw one side of the gate and then copy and flip it? It's so symmetrical. Well done! If I tell you I did, I'll be giving away one of those priceless secrets, and I can't be doing that. By the way, did you notice the slight "fogging" of the orphanage image near the bubble's boarder? Eraser with 0% hardness! I'm going to kick myself for using the phrase "0%hardness" ... go ahead, make the joke. I noticed the fogging and I thought it was maybe a little mistake, a product of you flipping the gate and it not fitting the thought bubble quite right. Going back to it, I see that you did it all the way along the edge and that it gives a nice "dreamy" effect. Nice! Interesting that you used a flaccid eraser.